What could possibly be worse than the feeling of your home damaged by a flood? Answer: Feeling that you’ve hired the wrong person to fix it! The fact is that hiring the right restoration business to repair your home’s water damage will save you stress and money in the long run. Beyond looking for a flood repair business that is licensed and insured—a requirement in Texas for all contractors—you want a Stafford flood restoration business that you can trust to provide exceptional service. 1. Is the business locally owned or a national chain? Local or family-owned businesses have strong connections to the community, because they live and work with you. On the other hand, national chains have the advantage of being part of a vast network that provides additional resources. SERVPRO of Stafford is unique in that we are both! We are your family-owned home restoration neighbors, with the backing of over 1,650 SERVPRO franchises nationwide. 2. Is the business certified by the Institute for Inspection, Cleaning, and Restoration Certification (IICRC)? The IICRC is an internationally recognized organization that sets ethical and professional standards for home restoration. Certification from the IICRC is a rigorous process, one that not all restoration businesses are willing to undertake. By hiring an IICRC certified business, you can trust that you are selecting one that is dedicated to doing excellent, professional work. 3. What do former customers say about their service? As the old saying goes, the proof is in the pudding. Testimonials from satisfied customers are significant because they provide evidence that the business delivered as promised. Ask around, and chances are you’ll find enthusiastic Stafford SERVPRO customers. 4. Do they give you a written estimate and clearly explain the process? Before any work begins, make sure the estimate is clearly recorded on the contract, along with an estimate for the services to be provided. At SERVPRO of Stafford, we make sure you understand everything before the work begins. We will take time to explain the contract, and even help you with the insurance claim process. 5. When are they available? Flooding doesn’t happen at convenient business hours. Whether it is caused by torrential rains or a faulty washing machine hose, you want a flood cleanup team that is there when you need them. Stafford SERVPRO, also serving Missouri City, is available 24 hours a day, 7 days a week. Stafford SERVPRO is well known in Fort Bend County for restoring the homes of many of our neighbors who have experienced water damage. If you are ever in need of emergency water or storm damage repair, we are here to help you get your life. But whomever you choose to help you get back on your feet, we hope you have a worry-free home restoration experience. Feel free to explore our Home Page for more information about our services, and to read testimonials from satisfied local customers. Stafford/Missouri City Home Care: Will My Homeowners or Renters Insurance Cover Storm Damage? Homeowners or renters insurance covers liability expenses for a variety of claims—from dog bites to electrical fires—but when it comes to Stafford storm damage, beware! Unfortunately, most homeowners and renters insurance does not cover flooding and water damage caused by the forces of nature. With our subtropical climate, flooding in Missouri City and City of Stafford is a common occurrence. Although local city governments work diligently to try to prepare residents by setting up local emergency alerts and evacuation plans, there is only so much they can do. But there is something you can do to guard yourself and your family—obtain flood insurance. If a pipe bursts in your home, it is considered water damage and is generally covered by standard homeowners and renters insurance. However, flooding caused to heavy rain or storms is considered flood damage. Since most insurance policies do not cover flood damage from weather conditions, the federally funded National Flood Insurance Program (NFIP) fills the gap by offering storm damage coverage to homeowners, renters, and businesses. According to the NFIP, the average flood insurance claim for moderate to low flood-risk properties in Texas is $31,103. With portions of Missouri City and City of Stafford located in zones FEMA considers Special Flood Hazard Areas, your cost and risk of storm damage could be much higher. Your local insurance agent can help determine your risk and aid you in getting the right coverage for your home or business. Remember, there is a 30-day waiting period for policies to take effect, so the sooner you get covered, the better. Besides your insurance provider’s phone number, another important number to have on hand is your locally owned SERVPRO. SERVPRO of Stafford, also serving Missouri City and the surrounding Houston metro area, stands ready to help at any time, when disaster strikes. As the preferred storm damage restoration provider of most insurance companies, SERVPRO of Stafford can help you with everything from filing a claim to storm damage cleanup, and to the complete restoration of your home and personal items. The local city councils of Stafford and Missouri City work closely with FEMA to decrease the risk of flooding with Storm Management Plans, but the rest is up to you. Contact your local insurance agent about flood insurance coverage, and explore the SERVPRO of Stafford/Missouri City website to learn more about our storm damage remediation services. There are a lot of different opinions when it comes to removing mold. A lot of people think the task is easy until they keep getting the mold, again and again, then they realize they should call SERVPRO. If you want the mold gone the first thing you have to do is isolate it. Next step is to prevent mold spores from spreading to other sections of the home, SERVPRO specializes in mold removal and can do this for you. There is mold in your HVAC system. If you developed mold from contaminated water or plumbing problems. You have an excessive amount of mold. You have medical issues that could get worse with the introduction of mold. SERVPRO is available 24/7/365 to handle all of your mold removal needs, should the process be too complex, give us a call today (281) 403-2256! Here at SERVPRO, our professionals are trained in adhering to the highest sanitation standards. We understand that time is crucial for your operations and your patients. Our technicians know how to handle waste and undergo special training to work in operating rooms and other restricted areas, always adhering to HIPPA regulations. We also coordinate with environmental and infection control teams to monitor progress and make sure that all necessary health certifications are obtained prior to completing any job. Our first priority is to quickly and safely take full responsibility of your cleanup needs so that you are free to focus on your first priority: the patients. You don’t have time to worry about the common wear and tear that gradually soils your office. 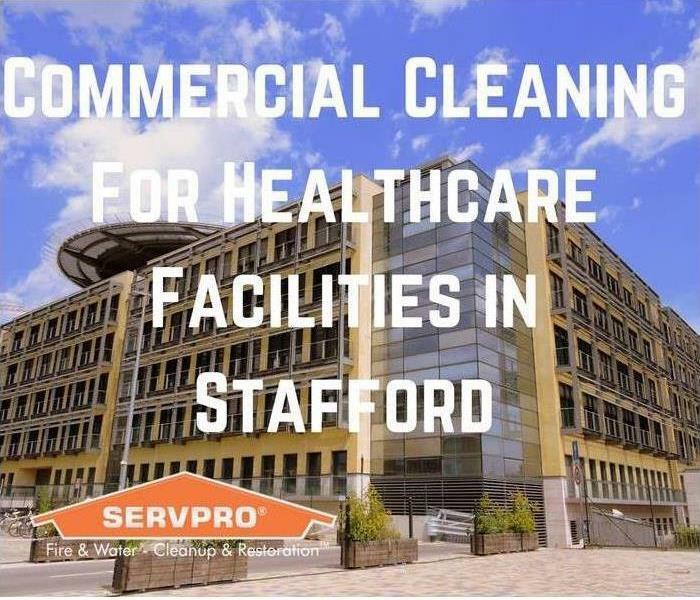 When grime, odor and moisture challenges go beyond the scope of your regular janitorial staff, call in your local SERVPRO® Franchise Professional. Whether it’s removing an odor problem or deep cleaning flooring or carpets, you can rely on SERVPRO® of Stafford/Missouri City to make your work space look its very best. SERVPRO® of Stafford Missouri City will get the job done right and get it done quickly because the SERVPRO® Advantage includes these benefits: Award-Winning Training, Nearly 50 Years of Experience and Exclusive Cleaning Products. SERVPRO® of Stafford/Missouri City offer cleaning services ranging from cleaning restaurant hoods to removing biohazard contaminants. They have the specialized training and products to get your property back to business. Their cleaning services include the following: Air Ducts and HVAC, Biohazard, Carpet and Upholstery, Ceilings, Floors, and Walls, Drapes and Blinds, Odor Removal, Sewage, Trauma and Crime Scene and Vandalism. The SERVPRO® Commercial Large Loss Division is composed of our best of the best in restoration. Our elite large-loss specialists are pre-qualified and strategically positioned throughout the United States to handle any size disaster. Every large loss is supervised by a commercial operations manager to help ensure seamless communication and timely mitigation. The SERVPRO® Advantage is our ability to dispatch trained production professionals and cut costs through the strategic placement and oversight of temporary labor. At SERVPRO, our #1 priority is getting your business, kitchen, and dining room back in operation as quickly as possible. When disaster strikes your fast-food franchise, you need the expertise of a specialized team who is experienced in food service cleanup. At SERVPRO, our teams are trained in health codes, regulations and the use of food safe products. They understand the importance of getting your dining room, kitchen or production operational as quickly as possible. We’ll work to ensure all surfaces are restored and sanitized to the proper health codes and food safety specifications and you are able to get back to business and your patrons can get back to the food. AT SERVPRO of Stafford/Missouri City we believe learning shouldn’t be paused or canceled, even in the face of disaster. Disasters at an educational facility are highly complex and require a knowledgeable and flexible response. Whether we’re dealing with a small school campus or an institute of higher education, we work quickly to assess each unique situation and isolate the damaged area so that normal operations can continue in a temporary space while we restore your facility. Our professionals are trained to be mindful of legal and environmental concerns and strive to fully restore the damaged area while working within your budgetary constraints. Your job is to provide valuable lessons and information to the students, ours is to make sure you have a safe place to do so. We care about your safety, especially when it comes fire. As Houston’s most recognized name in smoke, water, and fire damage restoration, we’ve seen first-hand the devastation to home and family that fires leave behind. To help make this season a more enjoyable one, we’ve gathered these fire-safety tips for the home. Keep open flames away from décor, walkways, and doorways. The spring is nice and so are the smell of those spring scented candles. Be sure to keep them away from your decor and from areas where they can be easily knocked over. Do not overload electrical outlets. Be careful not to overload your outlets as this can cause overheating and start a blaze. Make sure that they are all in good repair and that you unplug them when not in use. Clean the fireplace and space heaters. After a season of sitting around, last years soot and dust make the fireplace and the chimney a fire hazard. Space heaters also collect dust or can fall into disrepair with frayed wiring. Before using your fireplace or space heater for the first time this season, give it a thorough cleaning and inspection. The National Fire Protection Agency (NFPA) has reported that many house fires start from home heating sources. Have An Emergency Escape Plan. The NFPA statistics show that only about one-quarter of American households have an emergency fire escape plan. People often over-estimate the time they have to escape from a house fire. Most think they have about 6-minutes and enough time to save belongings from fire damage, but in reality, it’s closer to 2-minutes. For your sake and the sake of your family, develop an evacuation plan and practice it. Check your smoke alarms. Smoke alarms save lives, but only when they are in working order. Check your alarms once a month by pushing the test button. Most smoke alarm failures are the result of dead or missing batteries or being unplugged from the power source. And remember to replace smoke alarms after 10 years of use. For more information about fire safety and prevention, visit NFPA.org. To learn more about advanced fire, water, or smoke damage restoration for home and business, contact us at (281) 403-2256. We are available 24 hours a day, 7 days a week to answer your call. We thought it was a good time to share some tips that could keep you and your family safe from getting burned. Scalds are one of the leading causes of burns in children under the age of 9 in the United States. To prevent your children from being scalded by hot water make sure that you are checking the temperature of their bath water before placing them in the bathtub. To ensure that your water won't be too hot adjust your Hot Water Heater to no more than 120 degrees F so that the chance of having water hot enough to scald someone is drastically reduced. Before giving them a warm drink like Hot Chocolate, make sure that it is cool enough for them to drink or hold before handing it to them. When cooking, make sure you turn your pot handles in over the counters so that they don't get knocked over by you or your kids by accident. For adults who use home oxygen make sure that there are no open flame sources nearby, and please do not smoke or let them smoke while an oxygen tank is in the room. If you are using a fireplace in your home make sure that you have a gate that protects embers from leaving the fireplace and that no one touches that gate while the fireplace is in use as it can be very hot if touched. If you do get burned the best thing you can do first is to place the burned area under cool (not cold) water for a few minutes to lessen the severity of the burn. If the burn is serious it is advised that you report to an emergency medical office to seek further treatment. For more information visit ameriburn.org or beburnaware.org and if any scalds are from the result of a fire and the damage is too much for you to clean yourself, call SERVPRO (281) 403-2256. Water can cause damage so many ways! This is an instance where our customer's water pipe had busted and it flooded the entire lower level of his home. Our customer has very nice hardwood floors that had to be completely removed and new ones had to be reinstalled. Our customer called SERVPRO to fix the water damage and then decided to have SERVPRO finish the repairs as well. We were in and out in what seemed to be no time at all thanks to our qualified repair technicians! The customer's ductwork in their crawl space that had been filled with water from a broken pipe had to be drained as well. SERVPRO of Stafford / Missouri City fixed the water damage, repaired the flooring and made the customer more than happy!